On August 29, 2011, GVL formally joined the RSPO as an ordinary member with membership number 1-0102-11-000-00. As a member of the RSPO, GVL committed itself to the sustainable development of palm oil in Liberia. Consequently, it is obliged to protect the environment and work in local communities for the sustainable management of their land. This also means GVL’s engagement with local communities is grounded on the principle of Free, Prior and Informed Consent (FPIC) by communities in relation to any expansion on their (communities) land. Membership to the RSPO also implies demonstrating a commitment to respecting the sovereignty, culture and traditions of host communities, preserving their sacred heritage and ensuring that palm oil production brings concrete benefits to them while at the same time protecting their rights to the land. GVL is owned by Golden Agri-Resources (GAR), a Singapore-registered palm oil company, through a Cayman Islands private equity firm. The firm’s ultimate owner is Indonesia’s billionaire Widjaja family. The largest financiers of Golden Veroleum’s parent Company include U.S. financial firms Vanguard, Blackrock, Kopernik Global Investors, Dimensional Fund Advisors, Northern Trust and Citi Group; Dutch firms Robeco and Rabobank etc. What led to the GVL’s withdrawal? The RSPO is a voluntary global certification body for the oil palm industry. It has several operational principles and standards to guide the operations of members within the sector. Two of the principles are of relevance to this analysis. Principle 2 focuses on the compliance with applicable laws and regulations by members. This principle has two criteria that are of importance to GVL’s actions. Criterion 2.1 There is compliance with all applicable local, national and ratified international laws and regulations. Criterion 2.3 Use of the land for oil palm does not diminish the legal rights, or customary rights, of other users, without their free, prior and informed consent. Criterion 5.1 Aspects of plantation and mill management, including replanting, that have environmental impacts are identified, and plans to mitigate the negative impacts and promote the positive ones are made, implemented and monitored, to demonstrate continuous improvement. Criterion 5.2 The status of rare, threatened or endangered species and high conservation value habitats, if any, that exist in the plantation or that could be affected by plantation or mill management, shall be identified and their conservation taken into account in management plans and operations. Since the company’s operations in Liberia, GVL has come under criticisms from national and international civil society organizations of several human rights violations and non-compliance to national laws and international environmental standards related to oil palm production. In February 2018, a decision by the RSPO Complaints Panel (CP) confirmed a series of ongoing violations by GVL, including failure to implement adequate free, prior and informed consent procedures, destruction of sacred sites and coercion and intimidation of community members to sign agreements with the company. 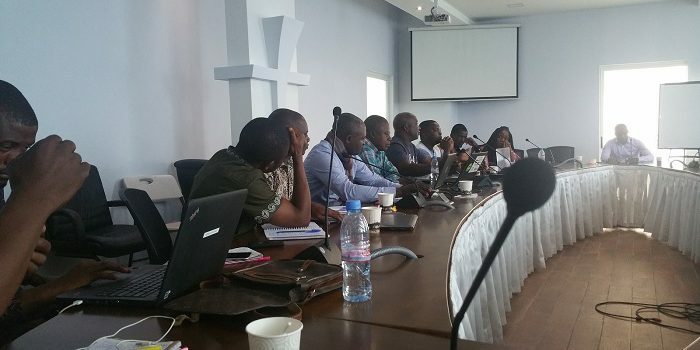 This decision followed from an independent review of GVL’s implementation of previous CP decisions that involved a number of complaints filed since 2012 by SAMFU and other civil society organizations that are working in Sinoe County. – GVL failed to carry out participatory mapping, and continued to construct on sacred land after being made aware and before and resolution was secured. In its ruling, the CP issued series of directives to GVL to address the deficiencies and was to submit an overall action plan on its implementation of the directives given and recommendations, no later than 14 March 2018. The RSPO offered to provide technical support to GVL in relation to addressing the directives issued. The ruling further stated that GVL was also expected to submit quarterly updates for the next twelve (12) months on the progress of the implementation of the action plan. The ruling also stated that any Party to this Complaint, who wished to appeal against the decision, shall have the right to submit a notice of appeal, no later than sixty (60) working days from the date of the decision. The ruling went on to state that in line with RSPO Code of Conduct, it called on GVL to act in good faith in implementing the above decision of the Complaints Panel. The ruling closed with this admonition: Any deviation from the above-mentioned milestones and timelines by GVL will be viewed adversely and may lead to consideration of suspension and eventual termination of membership. GVL excerpted to the ruling of the CP and failed an appeal with the RSPO which was rejected. The rejection of the appeal by RSPO was the main factor that led GVL to voluntarily suspend its membership from the RSPO in July 2018, nearly five (5) months after the ruling. What does the vulnerary withdrawal means? Voluntary withdrawal from RSPO is a contravention of Article 16 of the concession agreement: The concession agreement between the GoL and GVL contains all the elements of a legal contractual agreement and all provisions are binding on the parties and enforceable by law. The voluntary withdrawal of GVL from the RSPO contravenes provisions contain in Article 16 of the concession agreement and is a demonstration of bad faith. Bad faith in contract law is an intentional and dishonest act to not fulfill a contractual obligation and misleading the other party to enter into an agreement without the intent to fulfill it. Environmental implication: A clause under Article 16 requires that the investor shall from time to time, and at the request of the EPA, prepare and deliver additional studies and/or updated and or/amended Environmental Management Plan (EMP). The withdrawal from adherence to the principles and guidelines of the RSPO has a direct implication on the quality of any updated or amended EMP that the GVL is required to submit on a regular basis to the EPA for approval.